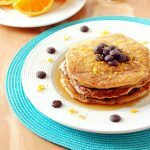 If you love the chocolate-orange flavor combo, you need to try these Orange Pancakes with Chocolate Chips! You know I love my smoothies six mornings a week. But on that seventh day, I really crave an indulgent breakfast. And, isn’t there something special about homemade pancakes on the weekend? Especially when they’re gourmet…even if I do say so myself. 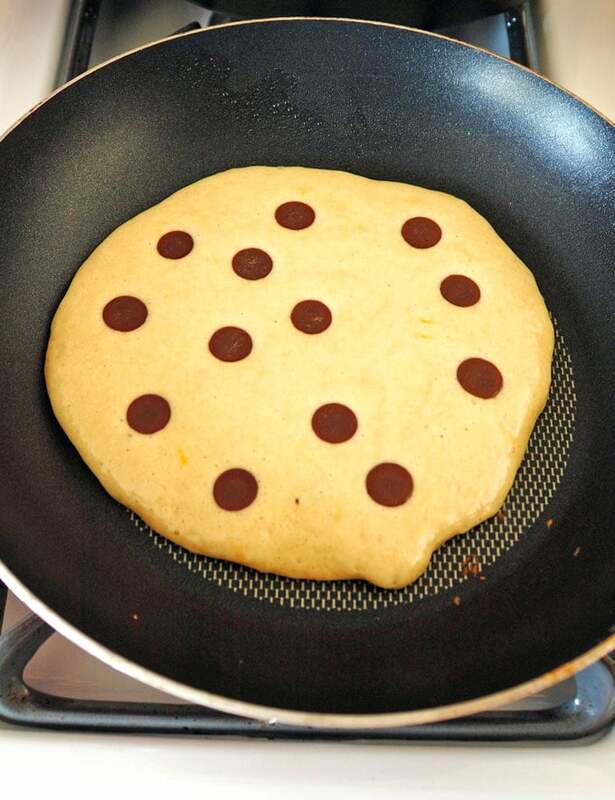 These orange pancakes with chocolate chips have lived in my imagination for over a month. I guess they’re inspired by similar cookies I bake, plus these Chocolate and Orange Pastry Bars and Mom’s Orange French Toast. All I know is, this recipe idea popped in my head, and I could smell the fragrant, orange-zested flapjacks and taste their melty, bittersweet chocolate chips, made sweeter with pure maple syrup drizzled over the top. So, after fantasizing about these pancakes for weeks, I finally brought them to life. And, after a few tweaks, I created the decadent breakfast of my dreams. So, if you’re a dark chocolate fan like me, there’s no better option than bittersweet. But, I suppose you can use milk chocolate (gasp! ), if you’re so inclined. Just make sure to add the chips after you pour some batter into your pan, to prevent the chocolate from burning. Let your batter cook for about 30 seconds, then place the chips on top, pointy-side down. Then, wait until you see bubbles form and pop on the surface before you flip the pancake over. 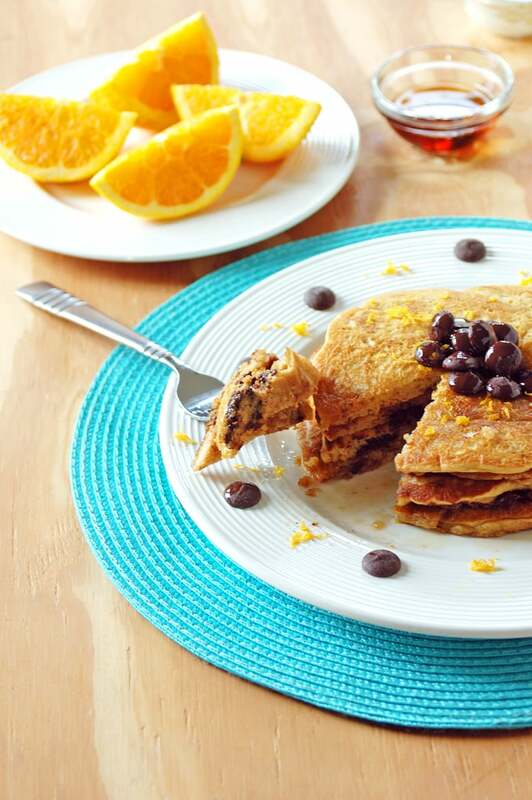 Sundays are made for these orange pancakes with chocolate chips, don’t you think? I hope you enjoy them as much as I do. If you love the chocolate-orange flavor combination, you need to try these! Zest your orange until you have two teaspoons. Set it aside. Add all the ingredients except the chocolate chips to a medium mixing bowl and stir just until blended. The batter should still be lumpy. Heat an 8-inch skillet over a medium-high flame, until it is hot enough that a drop of water splashed on it will sizzle. Spray the pan with cooking spray. Use a large serving spoon to pour some batter into the center of the pan, using two full spoons for each pancake. The pancakes will be about 6 inches in diameter. After 30 seconds, place 9-12 chocolate chips, pointy-side down, onto the batter. Flip each pancake when bubbles form and burst on top, and the edges appear dry. Cook the second side until it is lightly browned. 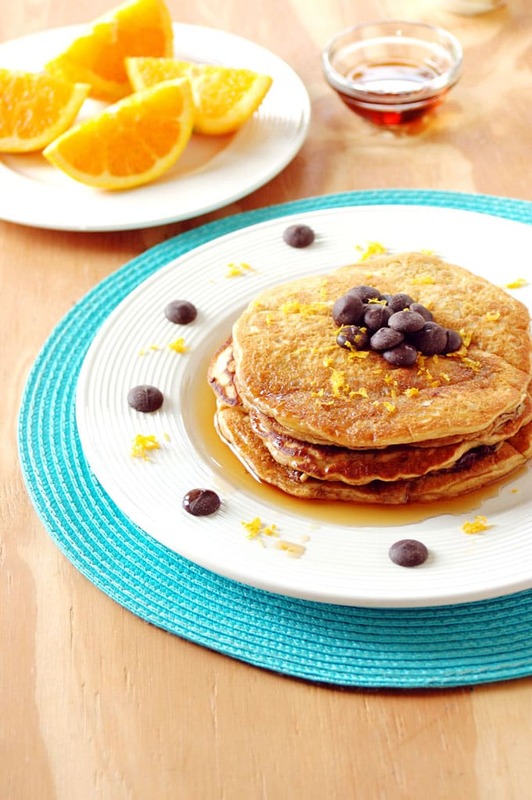 Remove cooked pancakes to a platter and cover with foil to keep warm. Spray the pan with cooking spray each time before adding batter to the pan. Serve the pancakes with butter and syrup. Store any leftover batter in the refrigerator for up to two days. Cooked pancakes can be frozen. I used to make these with white whole wheat flour only, but now I prefer them with all purpose flour. You could try a combo of half whole wheat and half all-purpose flour, if you wish. Chocolate and orange are a match made in heaven. Pure genius to put them into a pancake! I love it. What a nice combo or flavors! Just like those chocolate dipped orange slices! Delish! I would eat these faster than you could make them. Seriously…they look amazing! The flavor combo works so well in pancakes. I hope you give these a try, Revathi! Love the combination of chocolate and orange! These pancakes look incredible. Such a great way to start the day. Thanks, Tara! They’re a special treat for sure. 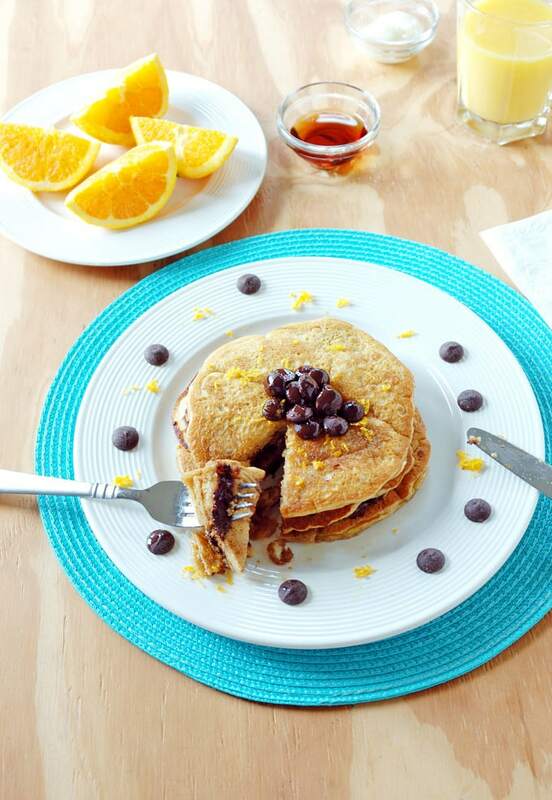 Yes to indulging in weekend pancakes! I have the griddle heating right this very moment for a batch of buttermilk pancakes (chocolate chip for my husband, blueberry for my toddler). I’ve never tried adding orange though, what a great idea! The orange adds such an interesting twist, Julie. I hope you try it!